Trump turns to see who or what is coming at him. Two separate incidents with protesters at a Donald Trump campaign rally in Dayton, Ohio occurred within the past hour. The 1st protester appeared in the middle of the crowd...in front of Trump (The protester is not visible in the video below but, Trump addresses him/her with taunts). 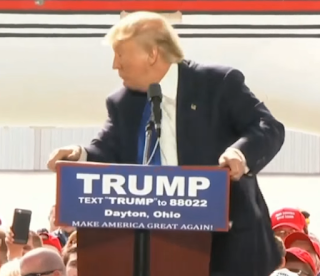 The 2nd protester, who is also not visible, either tried to get on the stage with Trump, or ran into the stage (causing the stage to shake) and was quickly put down. and during the editing of the video below. I need to watch the clip again in slow-motion and I'll likely upload another clip if there's anything else to see when viewed in slow-motion. I "rocked" the video back and forth a bit when editing it and I don't think there's anything else there to be seen. But, I will take another look. Just prior to the 2nd incident you can hear people in the crowd yelling to Trump, "Behind you!" He turns to look over his right shoulder and, because his hands were on the podium, it kind of "shook" (rattled) back and forth a little bit when he turned to see what was coming at him. This is the most complete clip you'll see of this incident. The video below begins with the 1st protester disrupting the rally and Donald Trump taunting him ("go home to mommy"). Seconds later, an obvious "disruption" occurs behind Trump and Trump appears visibly shaken for a few seconds (which is understandable). He recovers well, however. Oh and, all the sweat on his face...that was there prior to the "attack." It's well-documented on this blog and on my YouTube channels that I am NOT a fan of Trump. But, for ANYONE to ATTACK ANY PRESIDENTIAL CANDIDATE IS COMPLETELY ASININE - I DON'T CARE WHO THEY ARE OR WHAT "POLICIES" THEY REPRESENT! LEFTISTS, YOU NEED TO GET A GRIP ON YOUR SH*T!!! NO AMERICAN WILL TOLERATE ANY CANDIDATE BEING ATTACKED!!! Not even from you, you "special," entitled, coddled, babies who feel "threatened" when you're not in your "safe spaces" and want everyone who has more stuff than you to give you THEIR stuff. Grow up and knock it off, children! There is something to be said for Donald taunting another protester just prior to his getting bum-rushed on the stage (or whatever happened). Whether he'll ever admit that fact remains to be seen. Trump may want to think about how Obama's "taunting" of all of us Conservatives made us feel and maybe he should decide to NOT treat his own protesters in the way Obama has treated Conservatives for the past 7+ years. Of course, Trump would have to admit some modicum of guilt first. I don't see that happening. Good thing the police in Cleveland are stocking up on riot gear prior to the Republican Convention in July. We've already had 7+ years of complete and utter division and racial bullsh*t under Obama. With Trump as a CANDIDATE and these kinds of things are ALREADY occurring, I can't IMAGINE what 4 or 8 years of a Trump administration would be like for the United States. It could very well destroy this nation.